A yacht transfer request made it possible for a seaplane landing in Cuba for the first time in over 60 years. Our company is built on removing the limits on what is possible - this historic water landing is a testament to that. 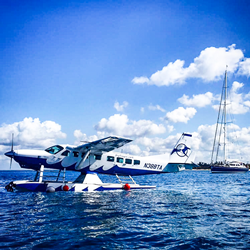 Tropic Ocean Airways, a South Florida-based luxury amphibious airline delivering the solution for elevated air travel to remote or congested destinations and Pacific Bound Yachts, a bespoke luxury mega-yacht and aviation travel and concierge agency specializing in “off the beaten path” destinations, partnered to complete the first water landing in Cuba in more than 60 years on March 5, 2019. The flight, a private charter coordinated fully by Pacific Bound Yachts for one of their clients and executed by Tropic Ocean Airways, was organized to pick up guests from a private yacht, located on the southern coast of Cuba and transport them to Miami International Airport for a connecting flight. This historic and highly anticipated flight took many months of planning by Pacific Bound Yachts (who are currently in the process of changing their name to Discovery Bound Yachts & Aviation) to ensure all necessary protocols and approvals were in place to ensure a safe and smooth flight experience. The teams conducted thorough research of the area and liaised with government officials from both countries. Pacific Bound Yachts was instrumental in the success of this initiative, providing critical details regarding optimal landing location and facilitating all required permitting and approvals. Both companies share a commitment to the safety and comfort of each guest, so nothing is left to chance. This momentous flight departed from Tropic Ocean Airways’ private departure lounge at Fort Lauderdale International Airport, made a brief stop in Key West, and continued into Cuban airspace where Cuban Air Traffic Control guided the aircraft to the designated water landing area. Once at the destination, the highly-trained two pilot cockpit crew conducted an aerial survey of the proposed landing area and coordinated with Pacific Bound Yachts’ Director of Aviation to ensure the safety and integrity of the proposed landing zone. The crew safely touched down into the protected waters ahead of schedule and moored the aircraft to a buoy adjacent to the yacht where Customs and Immigration officials greeted the crew and processed the guests returning to the United States. Pacific Bound Yachts specialize in providing megayachts and private aircraft support while visiting "off the beaten path" destinations. From Cuba and the Galapagos to Iceland and the Baltic, their highly personalized itinerary planning and local support in more than 35 countries ensures bespoke and immersive experiences for the world’s most discerning clients. PBY offers an integrative approach to support owners, captains and crew. Their team includes well-seasoned yacht agents, expedition leaders, and aviation specialists whose experience stretch five continents.